Edgar Allan Poe is revered as the father of the detective story. He pioneered the conventions that later writers would adopt. ​Poe's story, "The Murders in the Rue Morgue” (1841) features a brilliant private detective whose exploits are recorded by an admiring sidekick, murder victims discovered in a locked room, the arrest of the wrong person, and an ingenious solution. “The Mystery of Marie Roget” (1842), a fictional story inspired by a real crime, exemplifies "armchair detective" methods, as Poe's detective solves a murder by reading newspaper accounts of the crime. “The Purloined Letter” (1845) describes how the detective, consulted when police methods fail, finds the obvious but overlooked solution and uses trickery to foil the criminal. 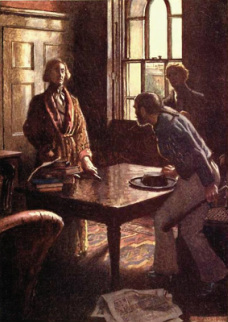 “Thou Art the Man” (1844) features a dogged amateur detective, a murder committed by the least likely person, clues planted to implicate an innocent person, and elementary ballistics to solve the crime. 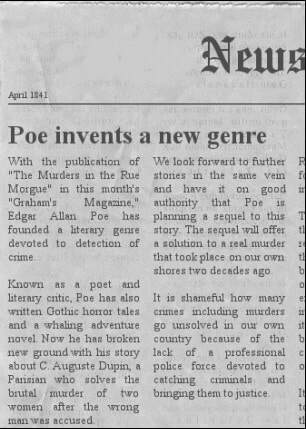 Poe never used the term “detective,” which first appeared in print in 1843, two years after “The Murders in the Rue Morgue” was published. Poe called his detective stories “tales of ratiocination.” The emphasis on reason in these tales contrasts with the emotional focus of his Gothic stories centered on obsession, guilt, insanity, and death. Orphaned at an early age and cut off by the family that adopted him, Poe watched his young wife die of consumption, gave in to bouts of alcoholism, suffered delirium, and died under mysterious circumstances. Both his fiction and his life have inspired mystery writers. Daniel Stashower, The Beautiful Cigar Girl: Mary Rogers, Edgar Allan Poe, and the Invention of Murder, the background behind the real crime that inspired Poe’s story about Marie Roget. Harold Schechter, Tell-Tale Corpse, historical mystery with Poe as the sleuth. Matthew Pearl, The Poe Shadow, historical thriller about Poe’s death. William Hjortsberg, Nevermore, historical mystery about murders that resemble the deaths described in Poe’s stories. Michael Connelly, The Poet, a thriller about a murderer who uses quotes from Poe’s works.